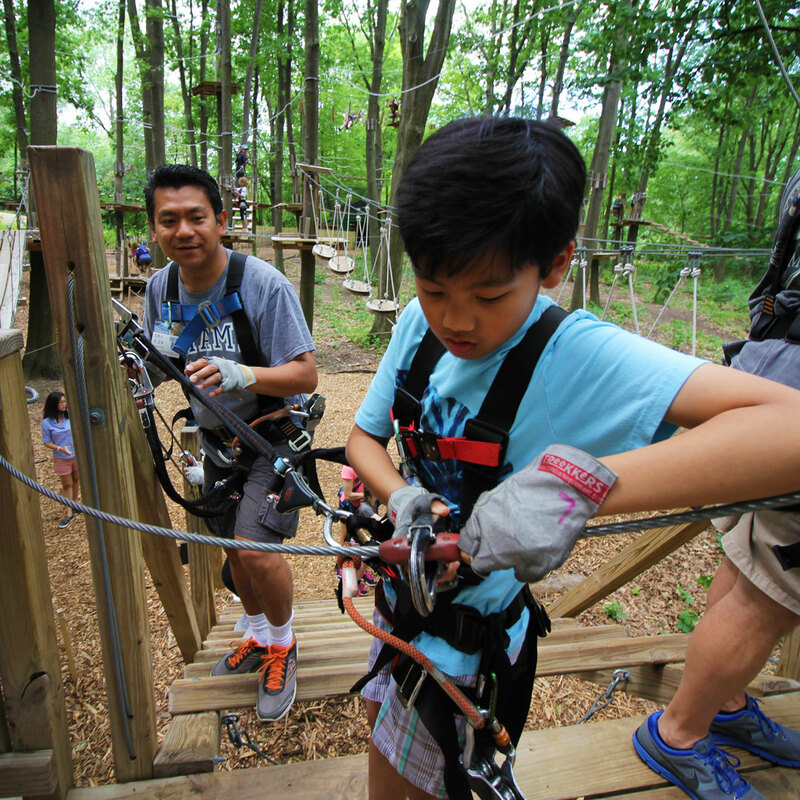 Our Aerial Park is made up of 12 aerial trails varying in difficulty, length, and height. The descriptions and photos below are a taste of what to expect during your adventure. Your challenge begins at the Main Platform. Climb the stairs up to the Main Platform where you will be greeted by one of our friendly Park Monitors. From there you can choose one of 12 trails. There are beginner trails (purple and yellow), two intermediate trails (green),two more advanced trails (blue), and two expert level trails (black and double black diamond). The two purple trails are built specifically for climbers ages five and six and younger beginners. Climbers are required to demonstrate their ability to conquer a beginner trail before moving on to intermediate trails, and an intermediate trail before moving on to the more advanced trails, and more advance trail before moving on to expert trails. Beginner trails are between 10 to 15 feet off the ground and suitable for all fitness and experience levels. 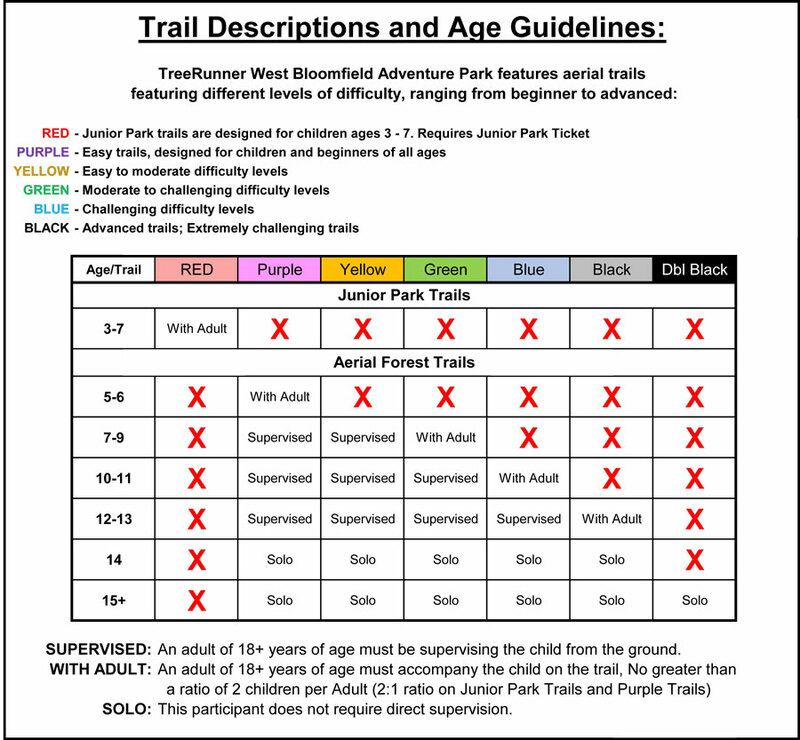 You must complete one of these trails before moving on to an intermediate trail. The obstacles are stable and easy to traverse for a first-time climber. Cricket consists of 10 elements, ending in a zip line. This trail features the Spider Web, which climbers climb across, and the Triangle Tunnel, which climbers climb through. Cricket is designed for younger children! This trail includes 10 elements, ending in a zip line. Firefly features crawling through several wooden boxes and traversing through netting. Another ideal trail for younger children. Sunflower contains 12 elements, ending in a zip line. Test your balance and strength with the Ring Crawl and hold on tight for the Fabric Band Walk. Beginner level. This trail incorporates 12 elements, ending in a zip line. Climb through the Broken Barrels, and traverse the Spider Rope Walk on this beginner trail. Beginner level. A variety of stable and swinging obstacles ranging in height from 20-35 feet. These trails are definitely a step up in a physical challenge. You must complete a Beginner trail before attempting these more advanced trails. An Intermediate trail must be completed before attempting a more Advanced trail. Forest Run involves 14 elements, ending in a zip line. Featuring two zip lines, a tightrope walk, and a flight between platforms via a log swing. This trail offers many attractions to the avid adventurer. This trail comprises 14 elements, ending in a zip line. With two zip lines in total, a Trapeze between platforms, and with a great view. Mountain trail is a great place for spectators to take pictures. A physical challenge that draws upon core muscle groups in the lower and upper body. Blue level trails are suspended at a minimum of 35 feet but range up to 45 feet from the forest floor. Blue level trails may take up to an hour to complete. An Advanced trial must be completed before attempting an Expert trail. Riptide blends 12 elements, ending in a slower descent auto-belay. Featuring, more prominently, the longest zip line in the park, Riptide also provides other wonders to the more experienced climber. This trail features suspended challenges wobbly boards, rope swings between platforms, and the walk over the park entrance offering a fun and exciting adventure trail. This trail links 13 elements, ending in a slower descent auto-belay. Waterfall is one of the more difficult trails in the park. Waterfall features challenging elements like the Ring Trapeze, the Tarzan Swing, and the more difficult ‘U’-Ropes, and Log Ladder. An intense physical challenge for the more physically fit and daring climbers. These two trails are 30 to 40 feet in the air, more challenging, and require more time to navigate. Difficulty levels are advanced and require patience and stamina to complete. Black Storm integrates 12 elements, ending in a Quick Jump (auto-belay). A difficult trail which features many unique challenges, including the Spinning Log Ladder, Swinging Triangles, and Hanging Peg Steps. A ball-seat swing and long zip line over the picnic area makes for a fun and interesting experience. This trail joins 15 elements, ending in a Quick Jump (auto-belay). Commando is the most difficult trail in the park. Every element is designed to challenge the climber. Climbing the ladder to the first platform is a huge accomplishment. Featuring long, unique, tiring obstacles, upper-body strength is a must to succeed. The second half of the trail is a gauntlet of the most challenging elements in the park. The “Devil Discs” are the most difficult, followed by the Rising ‘U’-Rope Climb and Sausage Ladder. Fortunately, there are two zip lines, which offer a nice break from the difficulty.